The smallest watertight compact binocular! Their minimal size means they will fit comfortably into any jacket pocket. No fewer than 16 lenses for an unexpectedly large field of view and brilliant, contrast-rich images. Interference mirror with a reflective capacity of 99.5 % over the entire light spectrum! During the coating process extremely specialized, micro thin coatings are applied with various highly scientific techniques to the surfaces of lenses and prisms. Some elements receive more than 30 coatings. This complicated procedure reduces reflections and controls all color spectrums to provide the highest light transmission, best contrast, sharpest resolution and optimal color fidelity. 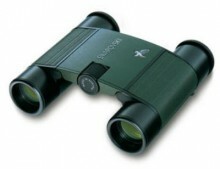 Click the button below to add the Swarovski 8x20 Pocket Binoculars (Hunter Green) to your wish list.